For pet owners who travel a lot, or people who just plain miss their animal companions, this will help ease you and your pets’ separation anxiety. 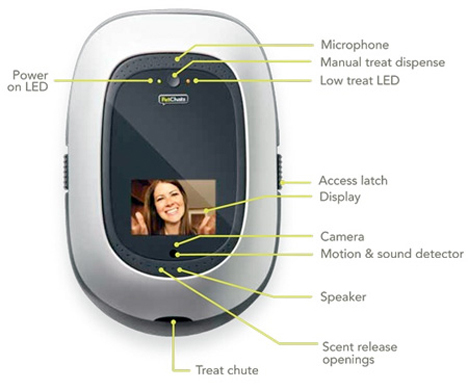 It’s a video phone that lets you ‘chat’ with your dog or cat face to face. 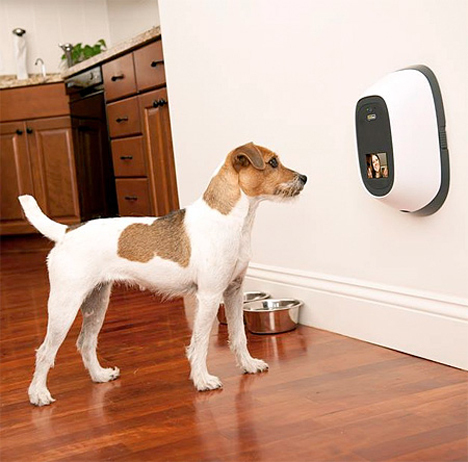 PetChatz video phone is a little wall hub that’s meant for on-the-go pet communication. It comes fully-loaded with a microphone, mini display, camera, sound/motion sensor, speaker, and, for the coup de grace, a treat dispenser. With the tap of a button, you can keep Fido or Whiskers happy. An app for your computer or mobile device lets you call your pet to PetChatz by playing an attention-getting chime. Granted, your dog or cat has to be disciplined enough to learn to come to the device, but if you can manage to get over that hurdle you can then see, speak to, and hear your canine or feline friend.